This recipe was an absolute hit wherever I took it last week. Even those people, who would ideally choose to eat a cheese steak every day, proclaimed it “pretty good”. While I sincerely doubt there is such a thing as a pie that’s good for you, this pie is healthy as compared to most pies. Free of trans fat, relatively low in sugar, and featuring whole wheat, this pie is quite possibly the smallest guilty pleasure you can indulge in this holiday season. The crust recipe was developed by my incomparable Aunt Judy, and the filling recipe is an attempt to quantify my largely eyeballing measurements. Particularly, if you prefer to taste more sugar than spice, you may want to adjust the quantities to suit your tastes. The dough for the crust is probably more delicate than you’re used to, so I strongly recommend following the instructions for rolling it out. Wash and peel the apples. Cut out the apple cores, and thinly slice the apple fruit. Evenly sprinkle the cinnamon, nutmeg, allspice, brown sugar, and apple juice/canola oil over the top. Stir until all apple slices are evenly covered in spices. Allow the mixture to sit at room temperature for at least an hour, or let stand overnight in the refrigerator, so that it becomes juicier. Preheat oven to 425 degrees. Sift white flour, whole wheat pastry flour, and salt together. Add oil and milk. Stir just enough to combine ingredients into workable dough. Do NOT over stir, or you will ruin the consistency of the mixture. If the dough is too dry to combine properly, add an extra splash of soy milk. Divide dough into two balls. Moisten a clean, flat surface. Lay down about 18in of wax paper. Sprinkle some flour on the paper, put one ball of dough in the middle, and sprinkle with some more flour. Tear off another 18in sheet of wax paper, and lay it on top of the dough ball. Use a rolling pin to roll out the crust. Try to keep it as perfectly circular as possible. It will roughly fit a 9in pie tin when it slightly sticks out the shorter lengths of the wax paper. To transfer it to the pie tin, fold the crust in half while still in between the two sheets of wax paper. Gently lift it up, and pull away the bottom sheet of paper. 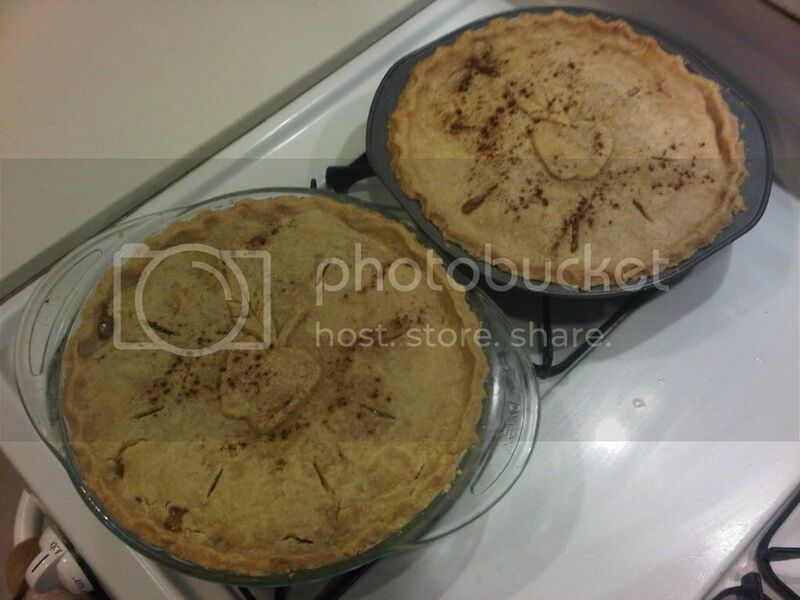 Place so that the straight edge lines up the middle of the pie tin. Unfold and remove top layer of paper. Add filling, and repeat for top crust. Seal top and bottom crust together by pressing with the prongs of a fork, and cut slits in the top for ventilation. Put the pie in the oven for 15 to 20mins to brown the crust. Turn the heat down to 325 degrees, and bake for another 30 to 40mins, or until a knife easily slides through the softened filling. I have thought for a long time that a whole-wheat pie crust would defy the heavens--and never tried it--but I'm willing to give this a shot. It is very important that you use whole wheat PASTRY flour. It has a different texture that actually helps make this crust a little flakey, despite lacking butter.